GenEpic Dietary Supplement - Restore essential nutrients lost due to stress, aging, and disease. GenEpic is a powerful blend of Natural products that can restore essential nutrients lost due to stress, aging, and in some cases, disease. To learn more call 1-307-220-0005 or contact us by clicking the link below. As a dietary supplement, mix 1 packet with water or juice with breakfast. If instructed by your health professional, take two packets daily, then take one packet with breakfast and one packet with lunch. Take only with advice from your healthcare PROVIDER. TAKE WITH FOOD. DO NOT TAKE IF PREGNANT. 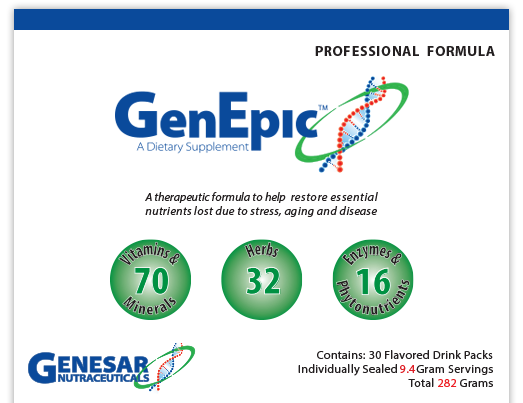 GenEpic™ is a professional formula scientifically designed to restore essential nutrients lost due to stress, aging, and disease. This therapeutic formula contains 70 vitamins & minerals, 32 herbs, and 16 enzymes & phytonutrients and, when used as adjunct therapy for certain diseases, is proving to greatly reduce negative side-effects and patient suffering. 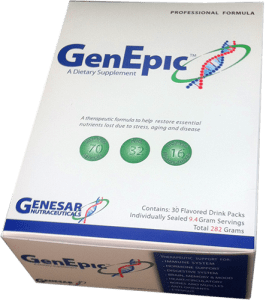 Unlike common, over-the-counter multivitamins, the higher potency and proprietary ingredients in GenEpic™ offer greater nutritional benefits. Please take time to view the data under the Clinical Trial tab conducted by Optimal Health Research.